English: Square Spurge, Square milk hedge. 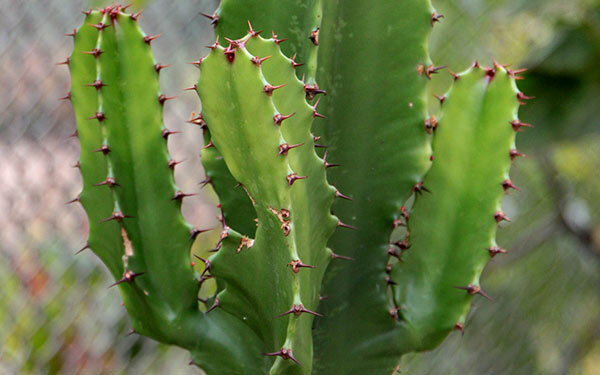 Antique Spurge is the largest armed cactus-like plant, growing up to the height of 7 m, branching, stems is 5 to 7 cm thick, dark green, glabrous, segmented and with a milky latex. Leaves are few, borne at the branch end, succulent, alternate, clustered at the tip, leaf blade, ovate, apex rounded. Flowers are yellowish-green, axillary, and single, subterminal, found in axillaries, single or in triads or 3 to 4 individual cyathia together and peduncles reddish brown colored. Fruits are in a capsule which is globulous, about 10 mm in dia., green when ripe turning deep red. Useful plant parts: The Latex, Leaves, Root and Fruits. To treat asthma, cough, earache, toothache, neuralgia, rheumatism etc.